Thailand-Singapore by aircraft (admitted to 2/14th A.G.H. 30.9.1945); Singapore-Fremantle, H.M. Hospital Ship Karoa. Ian Heppingstone was born into one of WA’s pioneering families. Educated at Trinity College 1913, Hale School 1914-15 and Perth Modern School in 1916-17. He later studied medicine in Melbourne and went jackerooing in Queensland, returned to WA mining area at Kalgoorlie before enlisting. He was recorded in 1936 and 1937 Electoral Roll at Yilgangie Queen Gold Mine, Yarri, Mine owner. His father David Eedle was at the same time pospector, also at Yarri. You can read more about Yarri area. David Eedle Heppingstone died 24 July 1939 and was buried at Kalgoorlie, having spent many years of his life in the goldfields region His father was born at Donnybrook in 1873. David Eedle Heppingstone and Adelaide Louise Swinson married 1899 at Bunbury. Ian’s mother Adelaide died in 1965 at Bicton, and was buried at Fremantle. A man of small physical stature, he was more than 40 years old when he joined 2/4th. He became known as ‘Pop’ by his soldier comrades, many of whom were half his age. A keen historian later in life, he devoted 38 years to voluntary research for Royal WA Historical Society, working virtually every Friday at the Society’s Nedlands headquarters. He wrote for the society’s journal, Early Days, and was a member of its council for many years. He was made a Fellow in 1978 and appointed Research Secretary in 1981. He was honoured in 1998 when the society’s research collection on WA was named after him. His interest in history stemmed from his family’s pioneering roots. His ancestors came to WA with the Molloy and Bussell families on ‘The Warrior’ in 1830s settling the South-West. His great- grandfather ran a whaling station at Castle Rock on Busselton’s Geographe Bay for 14 years and another relative captained seven whaling boats in the US. Ian Heppingstone remained single, never owned a car however looked after himself in his own home until just months before his death. Of his war years he said “there were good Japanese and bad Japanese”. He was related Harry De’Castilla WX10721. 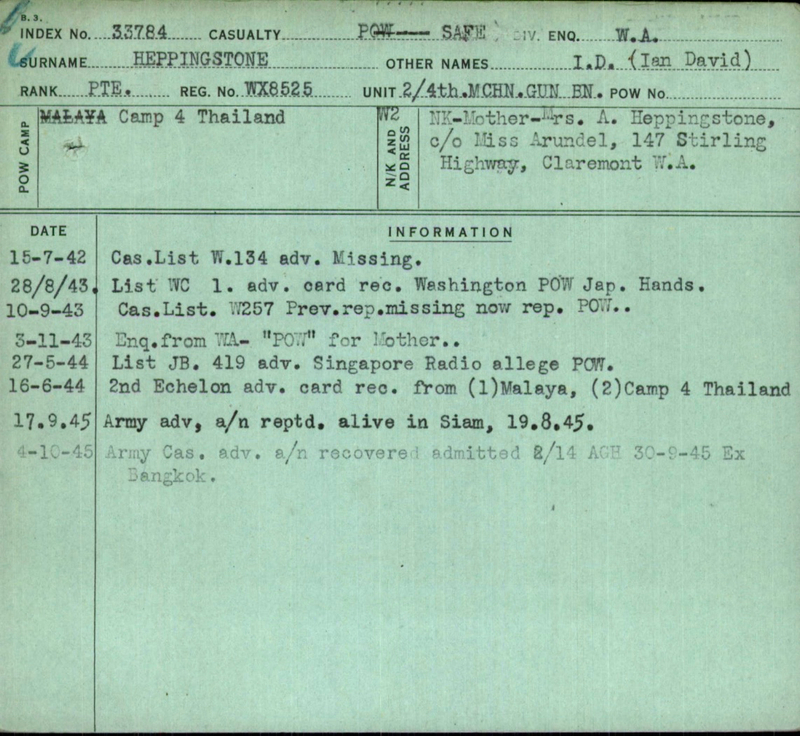 Heppingstone was selected to work on Thai-Burma Railway with ‘D’ Force Thailand S Battalion whilst a POW in Singapore. This workforce departed Singapore mid May 1943, crowded into railway trucks for Bampong Thailand. In terrible conditions, too cold at night and stinking hot during the day this journey took 4-5 days. S Battalion was fortunate to be trucked to Kanchanaburi and Tarsau where they were to begin the rail building task. Tarsau Camp was to become Japanese HQ for ‘D’ Force and a hospital. It was here Ian became ill and remained for 12 months. Perhaps a blessing because he missed the unforgettable Konyu II Camp and the other camps around the Hellfire Pass area. He rejoined S Battalion towards June 1944 at Tamuang and Chungkai Camps. 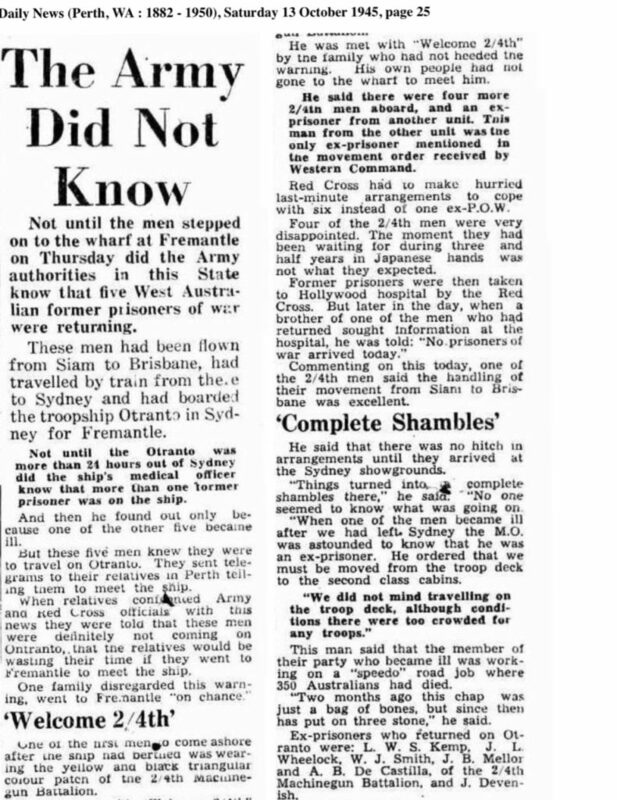 He was fortunate not to be considered ‘Fit’ by the Japanese and was not sent to Japan to work as so many men from S Battalion did. Instead Ian was sent to Konkoita to work on road repairs. Returned to Kanchanaburi he was selected to work at Petchaburi, Kachu Mountain Camp where was recovered from at the end of the war. He was sent to Bangkok before flying to Singapore, before boarding ‘Karoa’. Heppingstone was 12 months at hospital Tarsau with ‘Romeo’ Morris and Dave Whiteman. Pop Heppingstone died 28 May, 1999 and buried at Fremantle.